A dessert with layers of creamy lusciousness and chopped cookies can be part of a sensible eating plan—when you use sugar free gelatin and fresh fruit. Mix yogurt and dry gelatin mix in medium bowl until blended. 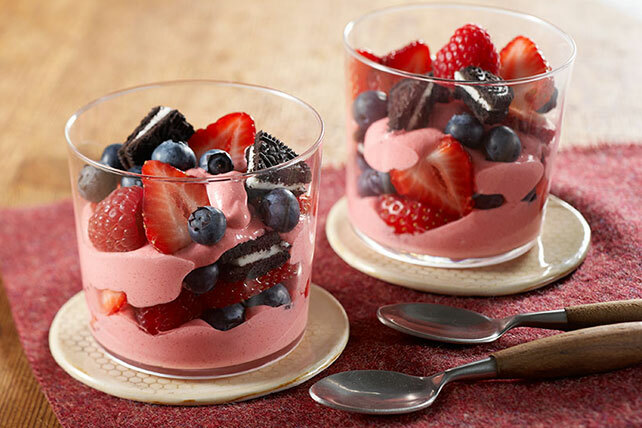 Layer yogurt mixture, berries and cookies in 6 dessert dishes. Use whatever cut-up fruit you have on hand, such as melon, pineapple and/or peaches. Prepare using strawberry low-fat yogurt, COOL WHIP LITE Whipped Topping and Reduced Fat OREO Cookies.